Between the ages of 1 and 3, children start their journey towards independence and personal power. This is a normal and healthy stage in their development. Of course, children require a great deal of guidance, but it’s important to respect and support this increasing need for independence and personal power. When children are supported in developing independence and given appropriate autonomy, they become more confident and secure in their ability to cope and survive in the world. Another way to say this is they develop a feeling of “being capable”. A sense of personal power and feeling capable is directly tied to whether or not a child develops a strong inner locus of control or outer locus of control. Research points to the fact that children who have a stronger inner locus of control do better academically and in the more long term, that people who have a strong inner locus of control live more successful and happy lives. But what is meant by locus of control? Simply put, if a person has a strong inner locus of control they believe that they have the power to make choices and control the outcomes of their life – their own success or failure. A person with a strong outer locus of control believes that external forces (people, circumstances) have power over their life. When we try to control children, we contribute to them developing an outer locus of control. Of course, we need to provide children with structure and guidance. But within that structure and those guidelines we can still leave space for the development of an inner locus of control. The following is one way that we can do exactly that — provide guidance and structure while contributing to the development of a child’s inner locus of control AND invite cooperation from the child because it gives them some personal power. The magic tool? Give children limited choices. Give the child two choices (you can live with) and then add “You decide”. This turns the locus of control over to the child. For example – your child doesn’t want to brush their teeth. Give the child the choice of “Would you rather brush your teeth before you put your pyjamas on or after you put your pyjamas on? You decide.” The expectations (structure) have been set – but the child has some personal power and choice in the matter. The locus of control has been handed from you to him or her. 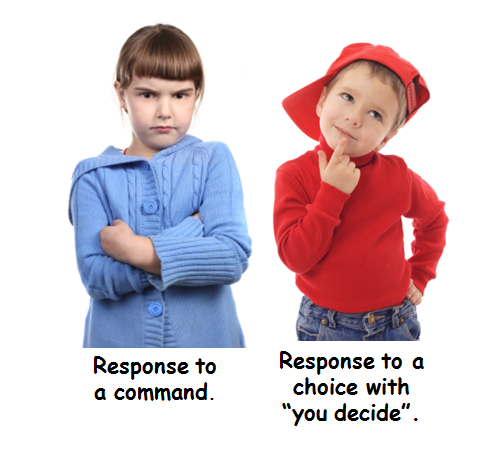 The picture below depicts the different responses that a child will likely have based on whether they are responding to a “command” or whether they are being handed the locus of control – in this case a choice with “You decide”. 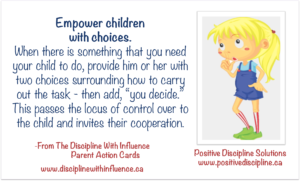 In my Discipline with Influence Online Parenting Program I outline a number of ways to support children in developing an inner locus of control.